Phillies manager Gabe Kapler watching Maikel Franco take batting practice in Clearwater, Fla. Yesterday, for the final time before they break camp on March 25, the Phillies had a day off. Good thing, too, because tonight feels like one of those rare can’t-miss occasions in spring training. Not only is Bryce Harper scheduled to be in the lineup, but he will be facing the Yankees under the lights at George M. Steinbrenner Field in Tampa. Harper grew up wanting to play for the Yankees and dreaming of becoming the next Mickey Mantle. He must have felt a sting, then, when the Bronx Bombers made no effort to sign him. If only he had come along two decades earlier. It’s hard to fathom Steinbrenner sitting out the Harper sweepstakes. Nobody hunted superstars as ravenously as “The Boss," and Harper possesses the magnetism that he found irresistible. But the Yankees’ disinterest, along with a lack of engagement from other usual big spenders such as the Cubs and Red Sox, enabled Phillies owner John Middleton to play the role of Steinbrenner and make an offer that Harper couldn’t refuse. It’s still only spring training, of course, but with a big swing, Harper can remind the Yankees of what they passed up. You’re signed up to get this newsletter in your inbox every weekday during the Phillies season and on Monday, Wednesday, and Friday mornings during spring training. If you like what you’re reading, tell your friends it’s free to sign up here. I want to know what you think, what we should add, and what you want to read, so send me feedback by email or on Twitter @ScottLauber. Thank you for reading. Third baseman Maikel Franco could benefit greatly from batting lower in the Phillies order. Sometimes, the best trades are the ones that don’t get made. By all accounts, the Phillies could have dealt Maikel Franco this winter. They didn’t, in part because they were waiting for free-agent superstar Manny Machado to choose a team. Once Machado agreed to a 10-year, $300 million contract with the Padres, the Phillies turned their focus to Harper and effectively took Franco off the trade block. And so, against all odds, Franco is in line to be the opening-day third baseman for a fourth season in a row. The Phillies haven’t had so much continuity at the position since Scott Rolen started six consecutive openers from 1997 to 2002. But unlike past years, when Franco was a middle-of-the-order focal point, he figures to be a seven- or eight-hole afterthought. There isn’t a hitter who stands to benefit more from the Phillies’ bulked-up offense, either. As opposing pitchers catch their breath from going through the Andrew McCutchen-Jean Segura-Harper-Rhys Hoskins-J.T. Realmuto gauntlet, Franco could feast on more fastballs. “He’s my pick to click in that lineup,” one National League scout said last week. It isn’t a crazy thought. Although it seems as if he’s been around forever, Franco is only 26 and probably hasn’t reached his peak. The Phillies recognize there’s room for growth, but haven’t figured out how to tap the potential. Hitting coach John Mallee worked with him last year on adjusting his swing to create a greater launch angle, but Franco’s ground-ball rate actually rose from 45.8 percent in 2017 to 49.5 percent. The result: Hot streaks interspersed with cold spells, reduced playing time, a .270 average and .780 on-base plus slugging percentage, and 22 homers in 465 plate appearances. Those numbers don’t work if Franco is batting third or fourth, but the Phillies will take them from their No. 7 or 8 hitter. And if batting lower in the order means that Franco sees more hittable pitches, there’s reason to believe his production might be about to spike. Everyone knew the Phillies needed to add talent to the roster this winter, but as Marcus Hayes writes, they already had their leader. His name: Rhys Hoskins. Defensive metrics weren’t kind to Harper last season, but was his defense really that bad? Then again, as Matt Breen writes, John Middleton isn’t paying Harper $330 million to win Gold Gloves. Here’s a really interesting story about the four-outfielder shift that teams might deploy against Harper. While Harper made his right-field debut Monday, Marcus Hayes went crowd-surfing to see what fans think of the Phillies’ new star. Meanwhile, Harper already has a Twitter bromance with Rob McElhenney from It’s Always Sunny in Philadelphia. In Monday’s newsletter, I took a swing at projecting the opening-day roster. Just don’t hold me to it. In this week’s edition of Extra Innings, our new Phillies podcast, Matt Breen and I discussed Harper’s defense in right field, the dreaded shift, and more. Plus, we answered readers’ questions. Listen here. You can find Extra Innings on all your favorite podcast platforms: Apple Podcasts, Stitcher, Spotify, Soundcloud and Google Play. Check us out, and please leave a review. Tonight: Harper is slated to be in the lineup in Tampa vs. Yankees, 6:35 p.m. 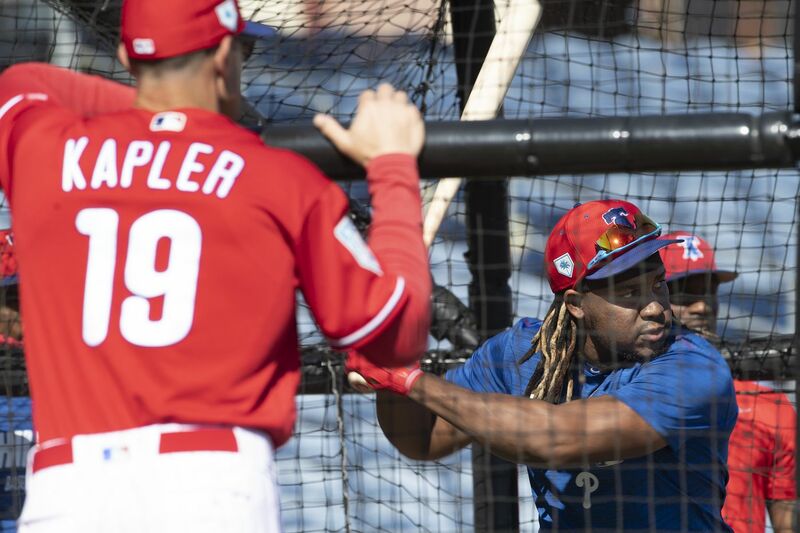 Tomorrow: Split-squad Phillies face the Pirates and Rays, 1:05 p.m.
March 25: Phillies conclude spring training in Clearwater vs. Rays, 1:05 p.m.
March 28: Opening day vs. Braves at Citizens Bank Park, 3:05 p.m.
April 2: Harper returns to D.C. to face the Nationals, 7:05 p.m.
Bryce Harper figures to see a spike in his home-run totals because he will play his home games in homer-friendly Citizens Bank Park rather than hitter-neutral Nationals Park. Last season, in a decidedly down year by his standards, Harper hit 34 home runs, the second-highest total of his career. Almost every preseason projection system, from Steamer to ZiPS, has him topping that mark simply because he will play half his games in homer-friendly Citizens Bank Park. But how much of a boost will Harper really get from his new home ballpark? Harper hit 17 homers at hitter-neutral Nationals Park last season. Not surprisingly, all 17 would have been gone at Citizens Bank Park, too, according to Statcast data. But the South Philly bandbox also wouldn’t have held at least nine balls that went for either doubles or outs in Washington, which would’ve raised Harper’s homer total to 43, one more than his career high from his MVP season in 2015. Answer: Thanks, Connor, for the question. If I was managing the Phillies, Andrew McCutchen would bat in the leadoff spot. Not only did he have a .414 on-base percentage and 10 homers in 49 games last season as the leadoff man for the Giants and Yankees, but he was tied for ninth in the majors in pitches per plate appearance (4.24). I think he’s the perfect table-setter at this point in his career. But Gabe Kapler also likes Cesar Hernandez at the top of the order, so McCutchen could start out batting fifth or sixth. Thoughts on being able to sign Keuchel or Gio Gonzalez for a 2 year deal? Not sold on VV, Eflin, Pivetta or Eikhoff. Answer: Good question, @Phl_cons. The sense that I get from talking with people in the organization is that the Phillies have no interest in Gonzalez and will pass on Dallas Keuchel unless it’s a one-year deal. They had the worst team defense in baseball last season, and Keuchel is a contact pitcher who is coming off his lowest strikeout rate (6.7 per nine innings) since 2014. More simply, the Phillies don’t view the lefty as enough of an upgrade over the four pitchers you mentioned (Vince Velasquez, Zach Eflin, Nick Pivetta, Jerad Eickhoff) to warrant a multiyear deal at age 31. I don’t necessarily agree, but that’s how they feel.